Highway Crash Barrier Cold Roll Forming Machine is for producing crash barriers/guardrails as desired drawings. Crash Barriers, also named as guardrails, which is for preventing vehicle accidents in most applications. The crash barrier is roll formed from sheet coil into W-Shaped rail and typically galvanized to get rid of corrosion from weathers, rains and other treating factors. The normal thickness is 3.2mm. Crash Barrier Cold Roll Forming Machine is a whole automatic line to produce guardrails with holes punched. Believe Industry Company have different designs of guardrail roll former for different production capacity requirements. Roller station quantity: 16 nos. The main base of the guardrail machine is MS fabricated structure and adequately ribbed to minimize the distortion. It is accurately machined on top and bottom surfaces the threaded holes are made on the bed for positioning the stands. 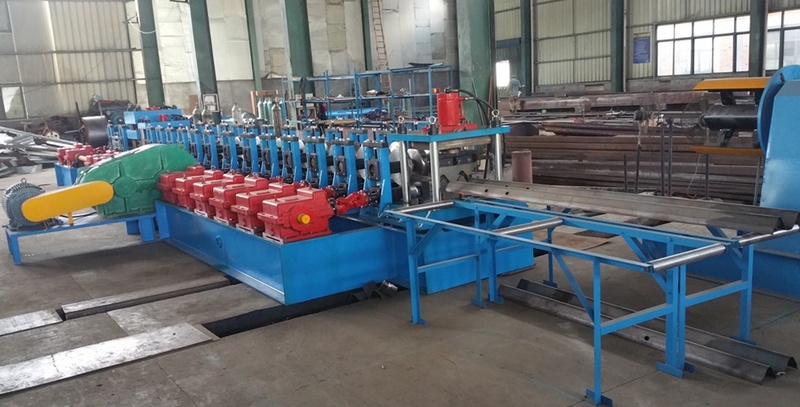 The stands of the crash barrier cold roll forming machine are mounted on the bed of the machine the line alignment can be easily done due to guide ways arranged on the bed of the machine. Each forming station consists of a fixed housing and sliding type out board housing. The mill stands will be arranged to locate shafts mounted on taper bearings. For the top shafts the bearings are housed in the cartridge type bearing blocks. The bottom shaft bearings are located in the bored machined in the housings. The bottom arbors are fixed in position whereas the top arbors along with cartridge blocks could be raised or lowered in vertical guides machined in housings. The roll shafts dia. 90 mm will be manufactured from quality steel and will be keyed to locate tooling. All the Roller will adopt quality GCR15 steel, heat treatment. The guardrail cold roll forming machine adopt post hydraulic cutting device after roll forming. Total power is supply from a 15 KW hydraulic station. Believe Industry Company have several designs of w beam guardrail machines. Contact us for more information.